Is there anyone left in the known world who hasn’t seen It’s a Wonderful Life? I suspect not, but if this applies to you, your heart has yet to be sufficiently warmed. This timeless, Christmas classic is a movie that is appropriate to watch all year long, because it’s really not about Christmas. It is, however, about many aspects of the human experience that we all reflect on a bit more during the holiday season. It’s about family dynamics, the karmic wonderment of selfless deeds being repaid, compassion for your fellow man…the list goes on. Frank Capra is often known for the unabashed and over-the-top wielding of sentiment in his films, but It’s a Wonderful Life tugs on your heartstrings in all the right ways. 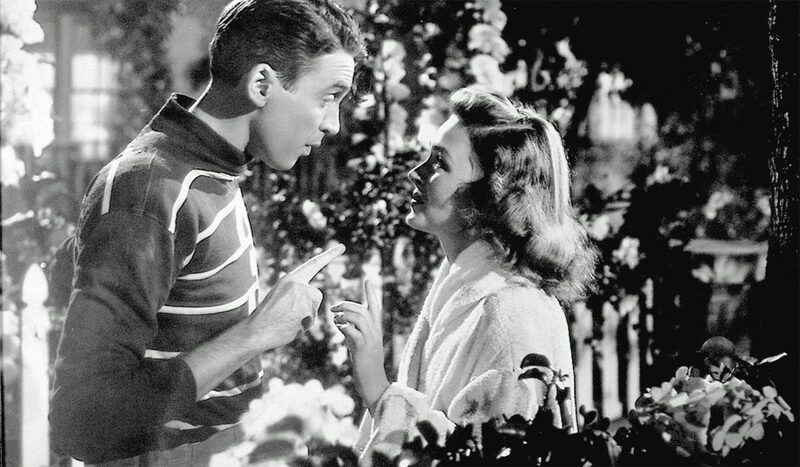 In an “aw shucks” casting match made in heaven, Jimmy Stewart and Donna Reed (#Pearlz4Dayz) star as sweethearts George Bailey and Mary Hatch. The story mainly follows George as he grows from boy to man in the small town of Bedford Falls; Mary, too, is an integral part of both the story and George’s happiness. As their life together unfolds, we see that George is a very special person with a tender heart. He saves his brother from a deadly fall through thin ice, stops a bereaved pharmacist from accidentally pouring poison into pill capsules instead of medicine, and takes over his father’s struggling Building & Loan company even though it means putting his own college dreams on hold. Time and time again, George thinks of others before himself, but a lifetime of doing so eventually starts to wear him down. He becomes frustrated that despite his best efforts, his family lives in a drafty house and has so little money with which to make ends meet. Meanwhile, the power-hungry Mr. Potter (who has Bedford Falls squarely in his pocket) makes money hand-over-fist by exploiting the townspeople George fights so hard to take care of. He feels defeated, insignificant, and crushed beneath the weight of a world that’s moving too quickly to appreciate him. When his uncle misplaces a large sum of money needed to balance their business accounts, George finally loses any shred of hope he had left, and believes he is worth more to his family dead than alive. He goes to a nearby bridge to jump, thinking that his debts can at least be wiped clean with his life insurance policy, but he is stopped by the appearance of his guardian angel, Clarence. George is skeptical at first, but Clarence is able to show him the life his family and friends would have had if he had never been born (suffice it to say that their Georgeless lives are much worse). Much to his surprise, George realizes just how much of an impact he has had on everyone he knows, and he urges Clarence to let him go back to living again. It’s a Wonderful Life has been parodied and referenced frequently in pop culture over the years, but it’s impressive how well the film holds up today. There is great acting all around, and I defy you not to tear up a little when the citizens of Bedford Falls come out en masse to show George how much his friendship has meant to them. If you remain stone-faced during this final scene, I think you might be dead inside…and we probably can’t be friends anymore. Even during the dark times, it is indeed a wonderful life, and this is a wonderful movie. Tomorrow, be sure to join us again for Day 2 of our 12 Days of Christmas series! Charles will be reviewing another beloved family classic: Miracle on 34th Street (1947). You won’t want to miss it!